Superconducting magnets; hybrid magnets; bench-top magnets. The National High Magnetic Field Laboratory (MagLab) has broken another world’s magnet record. This time, MagLab broke a record for a high-temperature superconducting (HTS) coil operating inside a high-field resistive magnet. With the technology, the agency achieved a magnetic field of 40.2 teslas. The previous record was 35.4 teslas. Tesla, or T, is the measurement of magnetic field strength. A refrigerator magnet has a field of 0.01 T.
Dozens of measurement techniques can be performed at the MagLab’s user facilities. MagLab is funded by the U.S. National Science Foundation (NSF) to develop magnet technologies for the scientific community. The group has broken several world magnet records. Magnets are used to study materials, chemical compounds and biological processes. These processes are revealed when a specimen is exposed to high magnetic fields. The high fields are created by running electrical current through conductors. Typically, in resistive magnets, insulators are used between the conducting layers to direct the current. But Maglab researchers devised a coil without insulation. This, in turn, allows more conducting material and current into a smaller area. The coil is 5cm long and 3.5cm wide. The coil is based on a rare earth called barium copper oxide or REBCO. This material conducts electricity without any resistance at relatively high temperatures. The REBCO material used in the magnet came in the form of a thin tape, which is made by SuperPower. The tape is 0.045mm thick. Some 240 meters of the 4-mm-wide tape were wound into 12 coils in the magnet. 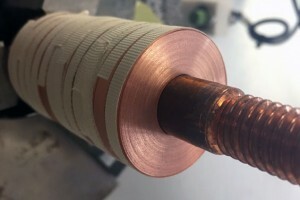 The test coil reached 9 tesla in a 31 tesla background field (Source: MagLab). The coil has a magnetic field of 9.2 T. The coil fits inside a larger resistive magnet, which has a magnetic field of 31 T. The resulting magnet delivers more than double the magnetic field-generating power per square millimeter than the previous record. “With higher current density you can generate a higher field in a substantially smaller footprint,” said MagLab engineer Seungyong Hahn, on the agency’s Web site. The European Magnetic Field Laboratory (EMFL) is building a new hybrid magnet with a continuous magnetic field of 43 T or more. The large-scale magnet is being built at the EMFL site in Grenoble, France. This project is a collaboration between the Centre National de la Recherche Scientifique (CNRS) and the French Alternative Energies and Atomic Energy Commission (CEA). The proposed magnet combines a resistive material based on Bitter and polyhelix coils. The superconducting coil is built around a Nb-Ti/Cu Rutherford Cable On Conduit Conductor (RCOCC). It is cooled down to 1.8 K by a bath of superfluid helium at atmospheric pressure. The commissioning phase is planned by the end of 2018. The EMFL consists of three high-magnetic-field laboratories in Europe—the Dresden High Magnetic Field Laboratory (Germany); the Laboratoire National des Champs Magnétiques Intenses (France); and and the High Magnetic Field Laboratory in Nijmegen (The Netherlands). Looking to bring down the cost of magnet-based measurement techniques, the University of Manchester, the University of Cambridge and others have devised a table-top cyclotron resonance (CR) spectrometer. CR spectroscopy is a non-contact technique for use in characterizing semiconductor and other materials. Meanwhile, the table-top system is based on a high-field pulsed magnet, enabling magnetic fields of up to 31 T. It also makes use of a terahertz detection scheme. This technology allows around 100 terahertz waveforms to be recorded over the approximately 14 ms magnetic field pulse. With this system, researchers explored the heterostructures of high electron mobility transistors (HEMTs) based on gallium nitride (GaN). More specifically, they characterized the two-dimensional electron gas formed at the GaN/AlGaN interface in HEMT structures. “The challenge when using these pulsed magnets is being able to record your data within the brief time period that the magnet is on. The breakthrough we have made is in the measurement technique, which is the leap forward that will now enable routine cyclotron resonance measurements on a table-top in a laboratory environment,” said Ben Spencer, post-doctoral research associate at the University of Manchester, on the university’s Web site.